Local industrial reel users are turning to Reel Tech, an Australian company with more than 30 years’ experience in fluid handling. 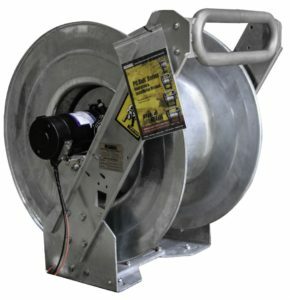 The company’s PitBull mining reel range, known for its unique safety design, construction and versatility has been expanded and can now be optioned with new, easily attachable accessories designed to make them even safer and more productive. Used by Australasia’s largest mining, oil and gas companies, Reel Tech’s range covers all applications and environments. What makes PitBull Reels safer? When designing new reel technology, Reel Tech’s core focus is on ease of use and operator safety. PitBull Reels can be integrated with a gearbox called Ezi-Deploy, which is an easy to bolt on accessory for all PitBull direct drive reels. Ezy-Deploy is an auto declutching system, with no levers, buttons or electronics required; the operator can simply pull and go with the lowest pull resistance. Ezy-Deploy clutch system offers smooth reel operation to minimise operator strain injuries and reduce excessive force that can prematurely damage equipment. Difficult pull force on payout adds to the risk of strain injuries for operators. This auto declutching system dramatically reduces hose payout force, minimizing strain injuries and eliminates chain and sprocket pinch points. Originally designed for Reel Tech’s Firedog range of truck mounted fire fighting reels, the Ezy-Deploy is now available as standard across the mining reel range. Reel Tech has released a complete range of PitBull hose reels with a gearbox designed for ‘safer’ rewind speeds and with rewind options including manual, pneumatic, hydraulic and electric. A new product called Safe-R-Reel is also available. It helps minimise the chance of employee and equipment damage due to excessive hose ‘speed whip’ during rewind. Excessive rewind speeds in motorised reels, whether spring or electric rewind, can cause hose to rapidly move. Rapid movement of hose and fittings can strike employees and equipment. Rewind speed can be significantly reduced by 30-50 per cent by using Reel Tech’s Safe-R-Reel brake cartridge system. This speed control system is easy and inexpensive to fit into many or existing spring rewind reels and protects the operator and equipment. This patented maintenance free non-belt and non-chain direct drive system ensures a controlled speed during rewind to reduce hose handling injuries. For spring reels, users can add Safe-R-Reel in full stainless steel that is chemically resistant, robust, durable, and offers a high level of safety. Manufactured in Australia, all PitBull reels are designed with hot dip galvanised frame and disc components, and with stainless steel full flow hub, fasteners and hose guide as standard. Hose reels no longer need to suffer from corrosion as all PitBull Reel range are hot dip galvanised, and as standard with stainless steel fluid paths, this means no painting and the ability of the reel to flow corrosive fluid without the need to change the reel internals makes it versatile, safer and most cost effective on site. Most people don’t know that PitBull reels are designed with the patented quick change hub technology, which allows users to quickly change hose sizes and diameters. Reel Tech has also recently released a range of easy to bolt on accessories for PitBull reels. These easy add-on options such a quick change hub make PitBull reels the most flexible reel and easiest direct drive reel to change out on site, saving time on the job. The PitBull range suits most hose sizes from ½” to 2” I.D. hose, available in ultra-narrow to large sized hose reels. Reel Tech has delivered numerous custom solutions from narrow reels for smaller spaces to fully automatic oversized reels. Users can also improve operator safety and handling with accessories like FlatWinder, an automatic hose layering accessory, allowing single operator control. The FlatWinder automatically layers the hose on the reel, so there is no reason for the operator to have to walk back to the reel at all during the operation — the system layers the hose onto the reel neatly every time. In addition to the FlatWinder, by adding Reel Tech’s Reel-in-Control long-range wireless remote control system, with adaptive frequency hopping — perfect for one-person hose handling applications — reducing multiple hose handling requirements. The operator has no need to touch the reel during rewind operations at all. 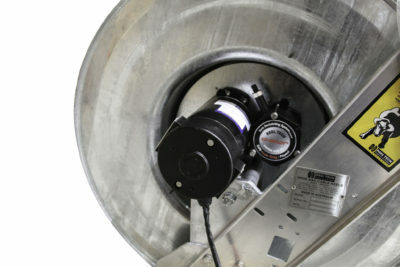 PitBull reels can also be ordered in manual rewind hose applications that do not require powered operation or control.